OLD FRIENDS CELEBRATE A BIRTHDAY. To do honour to the Master of the Winchester Diocesan Guild, Mr. George Williams, on his 70th birthday, a peal of Stedman Cinques was rung at Winchester Cathedral on Saturday. The band included a number of old friends, who had rung peals together between thirty and forty years ago, and it was a great delight to them to be able to meet and suitably celebrate the occasion. Peals at Winchester Cathedral are few and far between, and, on account of the services, it is always a middle-of-the-day job. Consequently, some of the company found it necessary to rise at, for them, an unusually early hour, to reach the ancient city in time. But it was a glorious May morning, and well repaid any unwonted effort. Soon after eleven o’clock they gathered in the Cathedral belfry, from London, Brighton, Slough, Woking, Swindon, the Isle of Wight, Portsmouth and Southampton. Several Winchester ringers were also present to join in the good wishes which were extended to Mr. Williams, and then, with barricaded doors to prevent any intrusion from visitors to the Cathedral, the ringing began. At first, about four courses were rung by way of practice, so it was said, although there was really a different reason for stopping. Then the bells went away again at noon, and were back into rounds just six minutes before the expiry of the time limit. The ninth man had a terrible gruelling on account of the bad ‘go’ of his bell, but he stuck it like a hero, although for an hour and a half most of the band had had serious misgivings as to the outcome of the valiant struggle that was going on on that particular box. Afterwards the ringers, with Mrs. Bayley and Mrs. Goldsmith, were kindly entertained to tea by Mr. and Mrs. Williams, and over the teacups the party naturally became reminiscent. One ringer could claim to have rung a peal with Mr. Williams 38 years before, and others well over thirty. ‘Anno Domini’ is thus rapidly passing with many, but none has it treated more kindly than George Williams, who, except for a few grey hairs, is the same active and enthusiastic George as of old. Mr. Williams’ first peal was rung at Soberton, Hants, on January 17th, 1884, and was the first peal by the Winchester Guild in Hampshire. His total is now well over a thousand, and throughout this long period he has laboured unceasingly for the benefit of young ringers, a great number of whom owe their early instruction in the art to him. In addition, he was for twelve years secretary of the Central Division of the Sussex County Association; he has been hon. secretary of the Winchester Diocesan Guild, and has now, for some time, filled the office of Master. He has been a member of the Central Council from its formation. MR. & MRS. GEORGE WILLIAMS’ GOLDEN WEDDING. COMMEMORATIVE BELLS FOR NORTH STONEHAM. The Master of the Winchester and Portsmouth Diocesan Guild and Mrs. Williams celebrated their golden wedding last Thursday, when they received numerous messages of congratulation and good wishes from ringing friends. On Saturday the ringers of North Stoneham, where Mr. Williams has built up an admirable band after getting the bells augmented to eight, and to which church he and Mrs. Williams are presenting two trebles to make a peal of ten in commemoration of their half-century of wedded life, presented them with golden wedding gifts, a walking stick to Mr. Williams and an umbrella to Mrs. Williams. Of course, a peal was rung at North Stoneham in honour of the event, and it was conducted by Mr. George Williams, who has been one of the greatest conductors in the Exercise during the last 50 years. By a coincidence this last was his 1,300th peal. Mrs. Williams was the first lady to ring a handbell peal. She rang three altogether, the first being in 1892. The others were rung in 1897; all of them were Grandsire Triples and Mrs. Williams rang 1-2. The peals were called by Mr. Williams, and they were thus the first married couple to ring a peal together. Mr. and Mrs. Williams desire to express their warmest thanks to the many friends who sent them presents and letters and telegrams of good wishes. On Saturday last the North Stoneham ringers held their annual outing to Sherfield English, calling at East Tytherley en route, where they rang touches of Grandsire, Stedman and Double Norwich. Meanwhile the Rector of North Stoneham arrived in his car with the Rev. T. Salmon (curate). On behalf of the North Stoneham ringers the Rector presented Mr. Williams with a walking stick and Mrs. Williams with an umbrella, on the occasion of their golden wedding. The Rector, in making the presentation, mentioned the fact that Mr. Williams was mainly responsible for the treble and tenor bells being added at North Stoneham in 1909, and now Mr. and Mrs. Williams were generously giving two new bells to increase the peal to ten to celebrate their golden wedding. Mr. Williams thanked the Rector, curate and the North Stoneham ringers for the gifts. He said he tried to do his best, although he found now he could not do as he used to do. His motto was to ring for both services and attend at least one of them. FIFTY YEARS OF PEAL RINGING. MR. GEORGE WILLIAMS CELEBRATES A JUBILEE. An interesting anniversary was celebrated on January 17th at Soberton. Exactly 50 years earlier, on January 17th, 1883, Mr. George Williams rang his first peal at this little Hampshire village. The event, at that time, was probably of minor importance, for the real object of the occasion was the first peal on the bells, which had recently been augmented, and the first peal in the county by the then young Winchester Diocesan Guild. To raise a change ringing baud two counties had had to be combed, and the peal was rung by G. H. Barnett (Farnham, Surrey) 1, G. Williams 2, J. Hewitt (Gosport, Hants) 3, F. Hill (Fareham, Hants) 4, W. Marks (Leatherhead, Surrey) 5, T. Newnham (Winchester, Hants) 6, S. Brooker (Leatherhead, conductor) 7, J. Weaver (Winchester) 8. The method was Grandsire Triples and the time occupied 3 hours 5 minutes. The peal is commemorated in the tower by a stone tablet, which also bears the names of the Rector, the curate and the churchwardens of that time and the name of the captain of the local ringers, Mr. G. H. Child. With the exception of Mr. Williams, all those whose names appear on the tablet have passed away. Since that peal was rung much ringing history has been made, and in the making of it George Williams has played his part. Throughout his long ringing career Mr. Williams has accumulated a big list of peals, his total is now just over 1,360, but his services to the art of ringing are not to be measured by the number of peals he has rung. Without the slightest reflection upon any of the great ringers, past or present, we have no hesitation in saying that no one has done more to help and encourage young ringers than has Mr. Williams. In his earlier days, when the famous band which rang at St. Peter’s, Brighton, between 30 and 40 years ago, was in the heyday of its success, Mr. Williams was one of the most brilliant conductors the Exercise has known, but then, as now, he was just as ready in and never happier than when helping a beginner through his first peal of Grandsire or a struggling company through a touch or their first peal in some simple method. Grandsire or London Surprise - it is all the same to George Williams. He expects a high standard of ringing, but he is always ready to make allowance for the failings of the beginner and to help him to overcome them. At the age of 76 Mr. Williams leaves the “heavy end” to others, but his almost uncanny ability to strike any bell perfectly, his keenness and mental alertness is in no wit impaired, while his physical fitness is something which many men 20 years his junior may well envy. It was not unnatural that Mr. Williams should be anxious to celebrate the jubilee of his first peal, and what more fitting than to do so with a peal at Soberton? So a “Wednesday afternoon” band was got together and the peal was rung: Holt’s Ten Part in 3 hours 5 minutes - the same bells, the same method, the same composition, the same time, and Mr. Williams ringing the same bell! Afterwards, over the teacups, a pleasant hour was spent together by the ringers, full of reminiscences which were a reminder that the conditions of ringing have vastly changed in these last 50 years. Those who, to-day, are “spoon fed” with their instruction, or who find their Surprise ringing available for the asking, have no conception of the difficulties which confronted the aspiring recruit in the “Eighties,” when few country bands could ring even Grandsire Triples, and peals were few and far between. To men like George Williams, who spend their lives striving to spread the art and lift it to higher standards, the ringers of to-day owe far more than they will, probably, ever realise. MR. GEORGE WILLIAMS’ NOTEWORTHY ANNIVERSARY. We are very glad to see that Mr. George Williams, the popular Master of the Winchester and Portsmouth Diocesan Guild, has sufficiently recovered from his long illness to be able to return to peal ringing. On Thursday, January 17th, he called Holt’s Ten-Part at Soberton, Hants. It was a notable occasion, for it was the 50th anniversary of his first peal as conductor. On January 17th, 1885, Mr. Williams called the same composition from the same bell in the same tower! Mr. Williams is in his 79th year, and in the band a fortnight ago was Mr. William Linter, sen., also in his 79th year. A lot of water has flowed under the bridges since that day in 1885 when Mr. Williams called his first peal, and Mr. Williams has rung a lot of peals, but there is no youngster to-day who is keener on ringing than he is when nearing four score years, and we hope his health now permit him to add many more peals to his list. ONE THOUSAND PEALS AS CONDUCTOR. MR. GEORGE WILLIAMS’ TOWER-BELL ACHIEVEMENT. At Dibden, Hants, on Bank Holiday, Mr. George Williams, the popular Master of the Winchester and Portsmouth Diocesan Guild, completed one thousand peals as conductor on tower bells. He will be congratulated on this distinction, not only for a great achievement crowning a life spent largely in the promotion of the art, but on being the only living conductor who has called a thousand peals on tower bells. In addition he has called four peals on handbells. The only other ringer who had called a thousand peals on tower bells was the late Mr. William Pye, while Mr. A. H. Pulling has scored over a thousand as conductor on tower and handbells. The following is the list of Mr. Williams’ peals up to the one at Dibden, but he is already on the way to call his second thousand, for he added another on Saturday. His peals have been rung in England, Wales, Scotland and Ireland. 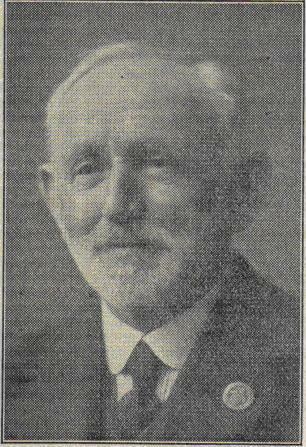 In this series of articles, which we hope to give relating to the Conductors whose names are already well-known in the Exercise, or who are among the coming men, no better beginning can be made than with Mr. George Williams, Vice-President and Master of the Winchester and Portsmouth Diocesan, who, at 80 years of age, is the oldest ringer to figure regularly among the peal conductors. Mr. Williams is a Hampshire man, and rang his first peal in 1883 at the little village of Soberton. The object of that peal was to score the first on the bells - which had recently been augmented to eight - and the first peal in the county by the newly-formed Winchester Diocesan Guild. Hampshire and Surrey had to be scoured to find a Grandsire Triples band. Mr. Williams did not ring another peal for year, and then he called one. Now he has conducted over a thousand. That bare statement, however, does not indicate Mr. Williams’ real contribution to the art of ringing. During his ringing lifetime he has taught an almost endless string of young ringers, and spent much time in helping aspirants through peals from Grandsire to the higher flights. Many ringers today owe what success they have achieved to Mr. Williams’ encouragement. It was while he was at Brighton in the nineties that he first achieved fame, for he was the mainspring behind the progress made by St. Peter’s Society in Surprise method ringing and in advancing in new methods. The band at that time were almost the first to ring anything beyond London, Cambridge and Superlative. They rang the first peal of Bristol Surprise, and some methods which are now no longer practised, but which at that time earned the Brighton band admiration for their performances. Mr. Williams has never set himself out for records; his peals have come mostly in the “usual routine,” as he has put it. He has rung peals in more than 300 towers in England, Ireland, Wales and Scotland and called peals in cathedrals as far apart as Dundee and Truro. He has rung a peal in all but six counties in England, and among the outstanding events which he looks back upon with peculiar pleasure are the first peal on the bells at Exeter Cathedral; the first peal of London Surprise in the City of London, and the peal, not long since, in the city, by the band all of whom had rung upwards of a thousand peals. When living in Brighton Mr. Williams was for years hon. secretary of the Central District, and when he left the county was elected an honorary life member in recognition of his services. After returning to Hampshire he filled the office of hon. secretary of the Winchester Diocesan Guild, of which he was afterwards made vice-president and Master. He has been a member of the Central Council since its formation. At North Stoneham, with which tower he became associated when living at West End, near Southampton, he built up a new band and quickly got the bells augmented to eight. To celebrate their golden wedding, Mr. and Mrs. Williams gave two new bells, making the lightest ring of ten in any church in the country; and in memory of his wife Mr. Williams has since presented to the church a handsome oak belfry screen. In this tower Mr. Williams has rung over two hundred peals. With mental and physical powers still equal to many men twenty years his junior, Mr. Williams will, we hope, long continue to enjoy the art of which he is so brilliant an exponent, and to remain or oldest conductor. All our readers will join us in congratulating Mr. George Williams, who reached his eighty-fourth birthday last Wednesday. Mr. Williams is the Grand Old Man of the Exercise, and few ringers have had a career in any way comparable to his. By birth a Hampshire man, he rang his first peal at Soberton in that county in 1883. He made his name when he was the conductor to the famous band at St. Peter’s, Brighton, in the nineties of the last century. They were one of the first to ring the Surprise methods as a matter of routine, and they were the first to score a peal of Bristol, Mr. Williams conducting. On July 19th, 1938, at St. Mary’s, Southampton, Mr. Williams and Mr. Frank Bennett, another notable Brighton ringer, each rang his 1,500th peal. Those were the bells which have since perished in an air raid. At North Stoneham, where he now lives, Mr. Williams gave two trebles to make one of the lightest rings of ten in the country. He shares with Canon Coleridge the distinction of having been a member of the Central Council ever since its first meeting 50 years ago. He is still hale and hearty, and we wish him many more years of activity and happiness. THE historian invariably prefers a lapse of 20 years to apprise the contribution of an individual to the community or to draw his conclusions to a set of circumstances. With the journalist his writings are generally confined to an expression of the immediate factual incident and the marshalling of facts and emotions as available at the time. Thus, in recording the passing of George Williams, the elements of greatness associated with his very long life have not the benefit of perspective. In the realm of achievement he certainly earned the title of a great ringer. He had amassed the immense total of 1,508 peals, and the fact that he had called more than 1,000 peals on tower bells tells its own story of amazing accomplishment. Viewed from the varied lists of advanced ringing to-day, his contribution was not exceptional, but of his total there were 475 peals in Surprise methods, and this indicates that in the prime of his life he was in the very forefront as a master of his craft. And his mental faculties remained unimpaired; he stepped quietly across the threshold of the earthly to the spiritual life as a normal process just like going to bed. This phrase “stepping quietly” seems in a sense to sum up the life of George Williams. From the formation of the Central Council in 1891 he had enjoyed continuous membership. With Canon Coleridge he saw the birth, growth and development of change ringing on a national foundation. Quietly observant of the trend of decisions, he put into practice the principles enunciated, and in his own county of Hampshire worked diligently for their fulfilment. While he was naturally keen on peal ringing, in no sense could it be said that he neglected the art of teaching, and he had the satisfaction of seeing this work bear excellent results. When he started the county had to be scoured for a Grandsire Triples band; to-day there are bands of advanced ringers in a number of centres. “Stepping quietly” in life and character is one of the attributes of spiritual grace. Bellringing to him was not merely a pastime; it was accompanied by an inborn love of the Church. At North Stoneham he added to the beauty of the Church by a beautiful oak screen symbolic of a sense of knowledge that the belfry is not the spiritual centre and that there is a duty entrusted to ringers to enrich by gifts and service other Church activities. It is important to ringers both young and old to retain that true balance in spiritual and temporal things as George Williams followed in his life. Ringing was not the all-absorbing thought; in his locality he gained the respect of the community for his work for the friendly society movement and in local government, and running through his veins he had the Englishman’s love of cricket. Thus mingling with the Hampshire earth at North Stoneham are the remains of one who stepped quietly amid a surround of greatness. Ringers in every Guild and Association will honour his name as one of the creators of modern ringing who has set a standard by quiet but purposeful endeavour that has enriched our art. Last week we briefly recorded the death of Mr. George Williams and mentioned certain salient features in his life which did much to advance the art of change ringing. We are indebted to Mr. George Pullinger for the fuller account of his life. 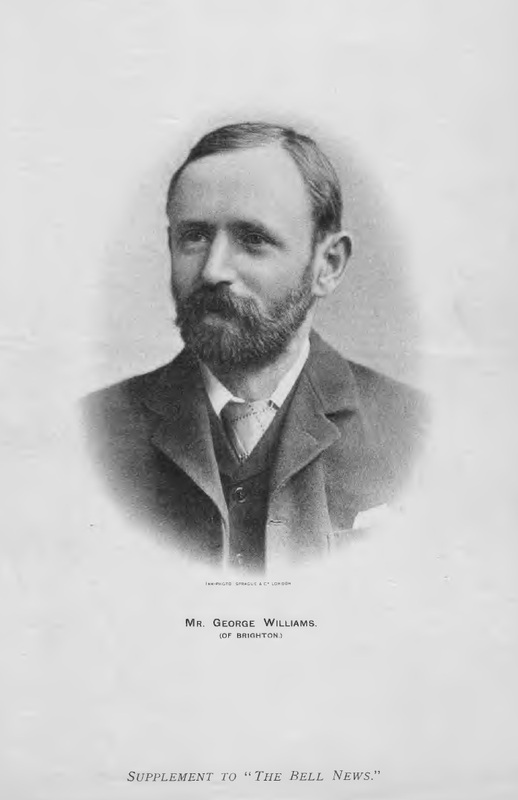 GEORGE WILLIAMS was born at East Meon, Hampshire, on May 7th, 1857, and was educated at the Dame’s School, Corhampton. He was apprenticed to a miller at Droxford and afterwards worked at Exton, Wickham and various mills in the district, before moving to Brighton in the early nineties. He returned to Hampshire in 1905 and was employed as chief clerk at Gaters Mill, West End, until he retired in 1923. He came to reside at Eastleigh in 1930. It was at Droxford, where his uncle was sexton, that he learnt to handle a bell by raising and lowering the curfew. He soon transferred his affection to the neighbouring tower of Soberton, where the ring of six had been increased to eight. Here there was a band that could struggle through Grandsire Doubles, and with them he had first lessons in change ringing. At that time he possessed a penny-farthing cycle and often rode to Southampton, a distance of 16 miles each way, in order to ring plain courses of Grandsire Triples. Among his recollections of those days was ringing the half-muffled bells of Holy Rood Church, Southampton, when the body of Livingstone was brought ashore on the last journey to Westminster Abbey. His first peal, Holt’s Ten-part of Grandsire Triples, was rung at Soberton in 1884 and was conducted by Mr. S. Brooker, who brought most of the band from Leatherhead. This was the first peal in Hampshire by the Winchester Diocesan Guild, which was formed in 1879. Mr. Williams joined the Guild in the following February. His third peal was also at Soberton in 1885. This he conducted and thus began the long career of one of the most able conductors the Exercise has produced. It was in the same tower that he rang the last of his 1,508 peals - Double Norwich Court Bob Major on May 8th, 1940. Previous to moving to Brighton Mr. Williams had lived for short periods near Midhurst, Sussex, and Capel, Surrey, where he quickly built up good ringing bands. At Midhurst he trained two complete bands at the same time - his “second eleven” as he termed them. These ringers included Dr. George, a very great friend, and Mr. W. R. Madgwick, who was killed in an air raid on London. At Brighton, in company with Mr. Attree, he quickly built up the famous Surprise company that scored many firsts. The Brighton weeks of Surprise peals were something that had not been achieved before. Of this famous band Messrs. George Baker and Frank Bennett are still living in Brighton. It was largely due to his energy and enthusiasm that ringing in Hampshire occupies its present position. He saw ringing in the area develop from Grandsire Triples to Surprise Royal. Mr. Williams called the first peal in the county in very many methods, and the number of ringers he piloted through their first peal was probably greater than any other conductor. He was secretary of the Winchester District from 1908-1911, general secretary of the Winchester Diocesan Guild 1912-1917, and Ringing Master from 1918-1949. Since 1905 he had missed only one annual general meeting of the Guild. In the wider field of ringing he was elected a member of the Central Council on its formation in 1891, and had enjoyed a continuous membership, missing only five meetings. From 1891-96 he represented the Winchester Diocesan Guild; 1897-1905 the Sussex County Association; 1906-17 honorary member; 1918-27 Winchester Diocesan Guild; 1928-49 Winchester and Portsmouth Diocesan Guild. He had served on the Peals Analysis Committee. The popularity of ringing tours owes much to his initiative; he was the forerunner of this pastime and many of his peals were the result of these journeys that took him to all parts of the British Isles. North Stoneham Church will always be associated with his memory. He joined this band in 1905 and was largely instrumental in raising funds to make a ring of eight in 1909. He gave two trebles in 1932 as a golden wedding gift and erected a beautiful oak screen in 1938 to the memory of his wife. Mrs. Williams died in 1935. She was the first lady to ring in a handbell peal, and to mark that occasion the Editor of “Bell News” presented Mrs. Williams with a set of 15 handbells. Mrs. Williams rang in two peals of Grandsire Triples in 1897, but never took part in tower ringing. Although best known as a ringer, Mr. Williams did not shirk from his responsibilities as a member of the community. He was a parish councillor, a volunteer, was a life-long Liberal, being at one time chairman of the West End Liberal Party, and a member of the Central Body of the Hampshire and General Friendly Society. There was a large attendance at the funeral service at North Stoneham Parish Church on February 1st. The Rector (the Rev. J. Stranack) officiated, assisted by the Rev. K. W. H. Felstead. Psalm xxiii. and the Nunc Dimittis were sung, Mr. D. Cecil Williams being at the organ. At the end of the burial service a course of Grandsire Triples was rung over the open grave by Mrs. Marshallsay, D. Matkin, A. V. Davis and F. Price. Among the ringers present were Messrs. E. H. Lewis (representing the Central Council), A. H. Pulling (Royal Society of Cumberland Youths and Guildford Diocesan Guild), A. Butler (Royal Society of Cumberland Youths), A. F. Martin Stewart arid M. Harris (Salisbury Guild), G, Baker and F. Bennett (Sussex County Association), A. York-Bramble (Universities Guild) and Mr. Sinclair (representing Mr. A. E. Young). The Winchester and Portsmouth Diocesan Guild were represented by Messrs. F. Rogers (general secretary), W. Linter (treasurer), G. Smith (auditor), Rev. K. W. H. Felstead and Mr. G. Pullinger (Central Council representatives). Other members present were Mrs. Marshallsay, Messrs. A. V. Davis, F. Price, D. Matkin, J. Turner (Bournemouth), D. Fraser, R. Flew (Basingstoke), R. Hunt (Hursley), J. Hill (Andover), W. Ireland (Romsey), W. Rose (Totton), W. Andrews, R Pain, G. Noice (Winchester Cathedral), W. R. Melville (Wonston), H. Higson (Bishopstoke), H. Newnham (Alresford), W. Upton (Newport, I. of W.), L. Page, J. Hunt (Titchfield), Rev. S. A. Gidlow (Goodworth Clatford), Mr. G. Preston, Miss Sparshott (Christchurch), Messrs. E. Whiteman and W. Linter (Bishop’s Waltham), G. Chappell (Wickham), F. Davis (King’s Somborne), R. Brown, W. Tucker, E. Dumper, C. Fray (North Stoneham), J. Faithfull, M. Butler, Miss Leahy (Southampton), Mr. and Mrs. E. Salmons (Portsmouth). Also present were Mr. and Mrs. Pat Cannon (Bletchingley), Mr. O. Giles (Shoreham), Mr. H. Reed. There were many wreaths. Those from ringing organisations were: The Central Council; Winchester and Portsmouth Diocesan Guild; Alton and Petersfield District; Andover and District; Christchurch and Southampton Districts; Basingstoke District; Portsmouth District; Society of Royal Cumberland Youths; Sussex County Association; bellringers of St. Nicholas’, North Stoneham, and Bishopstoke. Immediately after the service a peal of Stedman Caters was rung on the bells at North Stoneham with the bells half-muffled, and in the evening a peal of Grandsire Caters at St. Michael’s, Southampton. The following is a record of his 1,508 peals, of which he conducted 1,038. On six bells (Plain Bob to 7 Surprise), rung 33 (conducted 26). Bob Triples, 6 (4); Bob Major, 94 (68); Bob Royal, 8 (5); Bob Maximus, 1. Grandsire Triples, 129 (94); ditto (on handbells), 4 (4); Grandsire Major, 1 (1); Grandsire Caters 16 (11); Grandsire Cinques, 1; Union Triples, 1 (1). Stedman Triples, 312 (226); Stedman Caters, 57 (34); Stedman Cinques, 15 (2). Oxford Treble Bob Major, 3 (2); Kent Treble Bob Major, 110 (92); Kent Treble Bob Royal, 32 (19); Kent Treble Bob Maximus, 3 (1). Double Norwich Court Bob Major, 203 (162); Double Norwich Court Bob Royal, 2; College Exercise Major, 1; Champion Major, 1. Norfolk Surprise Major, 3 (1); Gloucester Surprise Major, 3 (1); New Cumberland Surprise Major, 6 (6); Bristol Surprise Major, 15 (3); London Surprise Major, 89 (64); Cambridge Surprise Major, 131 (81); Cambridge Surprise Royal, 14 (3); Cambridge Surprise Maximus, 2; Superlative Surprise Major, 200 (124); Yorkshire Surprise Major, 4; New Cambridge Surprise Major, 1; Spliced Surprise Major (4 methods), 1; Westminster Surprise Major, 3 (1); Oxford Surprise Major, 3 (2). Dear Sir,- Nobody will be missed more from ringing in Hampshire than the late Mr. George Williams. His name was a household word and his presence was as sincere whether in the belfries of the cathedrals or humblest country church. Ringing will be all the poorer by his removal from amongst us, and the finest memorial to his memory will be his only earthly wish that striking must for ever be the keynote of all ringing. Other tributes to his memory will appear in our next issue from Mr. George Baker and Mr. Frank Bennett. As a tribute to his memory, 720 Oxford Single was rung at Wickham, Hants, by Tom Page, Audrey Morrison, H. W. Merritt, Pat Page, G. E. Chappell (cond.) and John Hunt. At Swanmore, 720 Bob Minor was rung by H. V. Jones, Audrey Morrison, A. Mellard, E. Jacobs, G. E. Chappell (cond.) and H. Ainsley. As a mark of respect, 1,260 Grandsire Triples was rung half-muffled at St. Mary’s, Southampton, on Jan. 31st, by Miss J. Cox (first quarter-peal) 1, J. W. Faithfull 2, D. Cull 3, Miss Nelia Leahy 4, F. White 5, M. J. Butler (first as cond.) 6, R. Brown 7, A. Butler 8. It was a great shock and grief to me when I read in the “Sunday Express” of January 30th that my old friend, George Williams, had passed away. My recollection of him goes back to 1894, when the Royal Cumberland Youths rang a peal of Grandsire Triples at Arundel, my birthplace. I was then only a beginner, and it was not until October, 1896, that he conducted my first peal, Grandsire Triples, at Fareham. Three of us, Chamberlain, Haggett and myself, went to Fareham on October 2nd, 1896, and after two hours of good ringing we were stopped by the church clock winder throwing stones at the belfry window, making it impossible for the ringing to be continued. A fortnight later, on October 16th, the three of us from Arundel again journeyed to Fareham for a second attempt, and this time there was no interference from the clock winder, and we three beginners scored our first peal of Grandsire Triples in 3 hours 1 minute, conducted by George Williams. This peal was the beginning or a lifelong friendship, now severed by his passing at the ripe old age of 91. Most of the peals that I have rung were conducted by him, and in 1892 I migrated to Brighton and joined the St. Peter’s band, where George Williams was the chief conductor. Among other peals we rang together was the first “George” peal of Stedman Triples, rung at Lewes on April 24th, 1893, and many firsts in new methods, Bristol, Norfolk, etc. He (George Williams) also conducted the first peal of London Surprise rang in the City of London at St. Stephen’s, Coleman Street, on January 14th, 1899, and of this peal there is very little doubt that Frank Bennett and myself are the sole survivors. Although I retired from active ringing in 1907, George never failed to look me up when he came to Brighton, as he often did, and now it is goodbye from his old friend. It was with the deepest regret I heard of the passing of my dear old friend, George Williams. I first met him on March 2nd, 1889, at S. Nicolas’, Guildford, when he conducted my first peal, Grandsire Triples. That was the beginning of a friendship that has lasted within a month of 60 years. I met him again at East Meon on Whit Monday, 1891, when he called his 100th peal, Kent Treble Bob Major. He was a conductor of the highest ability, and for his weight a wonderful tenor ringer. I shall always remember the way he turned in Christchurch (Hants) tenor, 30 cwt., to Double Norwich on Boxing Day, 1892, and then in the evening rang St. Peter’s, Bournemouth, to another peal of Double Norwich. After my removal to Brighton we became almost inseparable and rang a large number of peals together, and I can honestly say we never had a disagreement. There were very few Saturdays that we were not out either to meetings or peal ringing, and mostly to oblige visitors, for at that time we used to get plenty of them, and George would always do his utmost to arrange something for them. It was a great loss to Sussex ringing when he left the county, and I did not see a great deal of him during my seven years in London, but since then we had had a good many enjoyable ringing weeks together. It was a great pleasure to us both when we rang our 1,500th peal together, although it was not pre-arranged. I was also in what was to be his last Double Norwich at Soberton in May, 1940, for his 82nd birthday. Of his activities after he returned to his native county in 1905 I must leave others who were associated with him to record. His cheery smile will be sadly missed by us all and his place difficult to fill. May his soul rest in peace. LEARNT A METHOD LAST YEAR. Dear Sir,- Although I only knew Mr. George Williams for five years, I would like to add my little tribute to the memory of a great man. Mention has already been made of the example he set to all ringers in his service to the Church, and to that I would simply add that of no one could it be more truly said that he was a Christian gentleman. One thing which always amazed me was his youthfulness and his buoyant spirit. Thus, last year I remember, when some 20 years his junior said they were too old to learn a new method, he learned and rang for the first time the No. 3 version of London Royal. Or, again, his peal books show that from October, 1938, to the end of 1939, when the war stopped peal ringing and when he was 81, he rang 25 peals in 17 different methods, including the only peal he ever conducted of Treble twelve, two of his four peals of Yorkshire Surprise Major, a peal of Stedman Cinques at the C.C. meeting, his only peal of Spliced 4, his only peal of Plain Bob Maximus (at St. Nicholas’, Liverpool), and the second of his peals of Double Norwich Royal (the first being in 1902). Such facts speak for themselves. RANG 300 PEALS WITH GEO. WILLIAMS. Sir,- I cannot allow my dear old friend, George Williams, to pass over without a few lines from me. In the 1890’s and after, although I only learnt Stedman Triples by looking at Troyte’s book twice, I went to Brighton for a peal and rang it at the first attempt, conducted by the late G. Williams.